In a large mixing bowl, combine sugars and then add peaches and toss gently. Cover and let stand for 1 hour. Line a 9-in. pie plate with bottom pastry; trim even with edge. Set aside. Drain peaches, reserving juice. 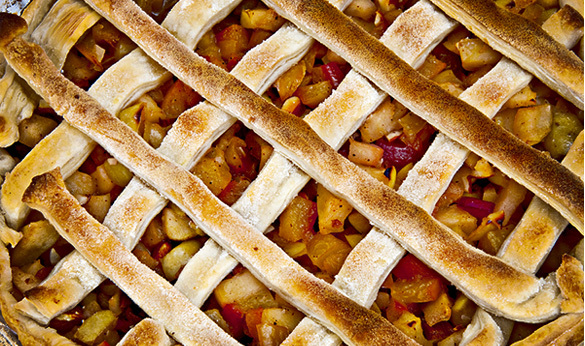 Roll out remaining pastry; make a lattice crust. Trim, seal and flute edges. Cover edges loosely with foil. Bake at 400 degrees F for 50-60 minutes or until crust is golden brown and filling is bubbly. Remove foil and cool on a wire rack.